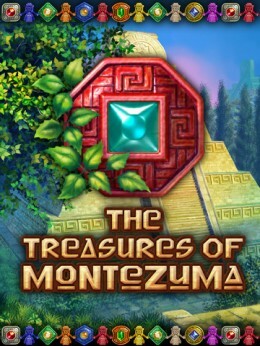 The Treasures of Montezuma HD is a fast paced match three game with iPad optimized graphics and incredibly addictive gameplay. 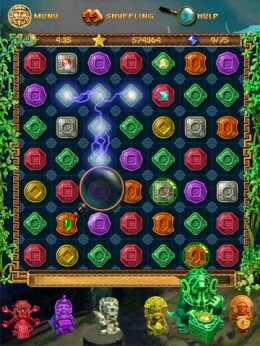 It’s similar to Bejeweled (which has yet to make its iPad debut) but packed with additional perks and power ups. Montezuma starts with the story of an archeologist uncovering ancient mysteries, but really this game is all about match three, power bonuses and score frenzies. The board itself operates like any other match three game. 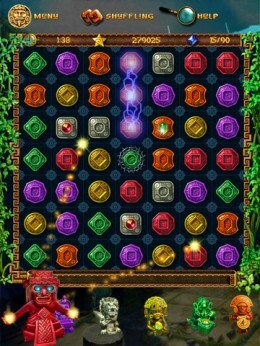 You tap-switch adjacent colored gems in order to create a chain of three gems of the same color. When all three gems line up properly they explode off the screen, leaving room for other pieces to drop down and fill the spaces that were once gems. The game continues like this until you explode the right number of gems off of the screen. Montezuma’s early levels encourage you to collect a dozen or so gems in an allotted amount of time, but as you progress the number of gems you collect increases as you race against the clock. Montezuma has two difficulty modes and 41 levels across five different stages. 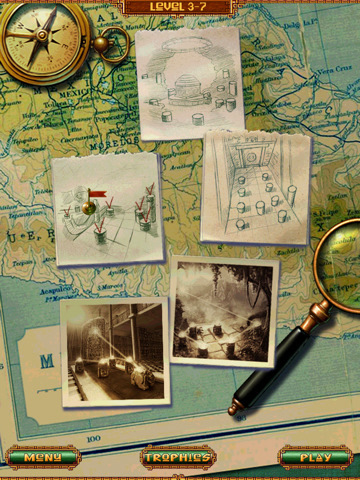 (The stages are basically between level progress maps that turn into pictures at the end of each group of levels for the archeologist’s accessory of a story.) There are also four bonus games (e.g. memory, catch flying stars, etc) and the opportunity to collect bonus stars as you progress through various levels. And this is where The Treasures of Montezuma HD gets really good. Whenever you pass a level (or get to a bonus level) you earn a gold star. Stars are essentially currency, and each one gives you the opportunity to buy an upgrade. Upgrades include totem powers, extra time, a hint power up that displays all hints on the screen for fifteen seconds, lightening bolts, a bonus that displays more gems on the screen at any given time, and much more. Choosing upgrades is fun, but actually seeing them in action is an absolutely blast. Once you have a few stars in your arsenal your touch seems to have more consequence on the fate of the overall game. Once simple gem switch can lead to an entire succession of explosions, and sometimes it feels like you’ve basically won the jackpot. To add to the fun, the game features excellent music and sound effects. When you score a ton all at once a powerful omniscient voice chimes in with a booming, “Score Frenzy.” You’ll find yourself living for the sound, as well as for the next possible moment that you can get your hands on Montezuma. The game lasts awhile and once you’re playing it’s hard to step away. This is a masterful match three game. The only thing it could use is online scoreboards and the ability to race against another live player instead of a clock. Bottom Line: The Treasures of Montezuma HD is a faced paced match three game with exciting sound effects and incredibly addictive gameplay. Expect to be torn away from this game.